Ask and you shall receive! Here’s Hashtag Interactive’s take the way Facebook is changing how people interact with their platform. We all know how Facebook’s News Feed Algorithm works and how it collects user data such as likes, shares, views, etc. in order to create really in-depth customer profiles that help you target your ads accurately. This new feature is bound to change that. Consider what Facebook has already been able to do with ad targeting, using only the data they collect right now – then, imagine what they can do after “Reactions” rolls out globally. “Reactions” provide a new way for users to engage with other users in a more meaningful manner that goes beyond whether or not you liked something. 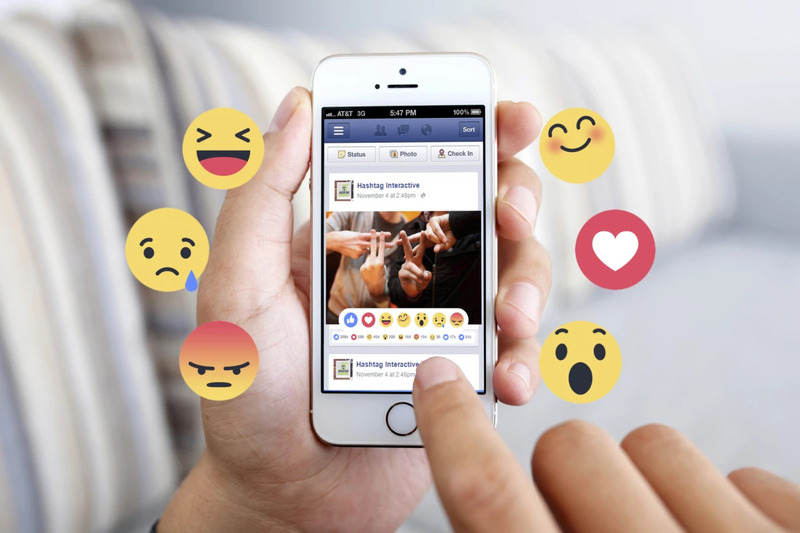 Facebook’s algorithm, however, has not yet been updated to factor in the new feature, as “Reactions” is still in the testing phase (the algorithm is currently registering all “Reactions” as likes), but they are hoping to upgrade it once the new feature becomes more widespread. From an analytics standpoint “Reactions” is sure to deliver some new and interesting data. But even more exciting is that it can get you accurate insights on how your audience feels about your brand. We emphasize this because customer emotions play a massive role in inspiring loyalty to a brand. This is the reason why this new feature is such an exciting undertaking for marketers. Because soon, we will be able to take part in a much richer interaction that will allow us to get deeper into the psyche of the consumer, allowing us to better understand, not just what they’re feeling, but also why they are feeling the way they do. This information is crucial in being able to determine what’s working and what to change in order to improve the overall customer experience. The fact that Facebook has provided multiple options for how one is to respond to a post means more data points for us to review, analyse and understand. Analytics aside, we also believe that this new feature can help you connect with your customers in a more human and more emotional level. Consider having the ability to send a timely empathetic engagement to customers who take the time to send feedback or perhaps share your content. This will make your business more relatable and helps your customers develop a positive association with your brand, which is essential to gaining their loyalty. Facebook Reactions is not without pitfalls, however. We believe there are some issues that you should be planning ahead for. One issue you should take note of is that “Reactions” is designed to make it easier for mobile users to express emotions with a few taps on their device. This could affect the volume of comments, which is an important aspect of social listening. Thus the call for more engaging content is greater than ever and your call to action messaging needs to be clear and clever. Another thing is that people might ignore the new feature altogether, especially in the early stages. But this is understandable as people will most often tend to stick to what they are used to. We think that, in the long run, reacting to a post will become as normal as hitting the “like” button. People will grumble about it in the beginning, but they’ll eventually accept the changes as has been the case with every new feature or layout change that Facebook has introduced. Lastly, there is the “troll” factor. No matter how clear Facebook’s guidelines may be, there will always be those people who will not use the new feature for its intended purpose. Users could express sarcasm, such as reacting with a “happy” emoji on a sad post, and so on. This may seem mundane, but it can mess with Facebook’s algorithm, especially during beta. Hopefully, they address this during the test phase and adjust accordingly. Also, statistically, “troll” reactions should be cancelled out if more people use the feature appropriately. So let’s go back to the question. Should you be worried? We don’t think you should be. Because, although, it’s true that the new feature is far from perfect, a lot of the issues are minimal and can easily be addressed by being creative and planning effectively. Something we at Hashtag Interactive specialize in. In fact, we are very excited to see this new feature in action, and we think you should be too. We see this is a new stage for social media marketing that can help you reach out to your customers in a much deeper emotional level. In addition, all the new data that it is bound to produce can help both Facebook and your brand to deliver a better and enriching experience for online users. Schedule a consultation with Hashtag Interactive. We will help you prepare for Facebook’s new feature by providing innovative strategies, delivering highly engaging content and managing your social media network to help you maximise its benefits. Don’t forget to drop us a line.